You need not to be Rumpelstiltskin to turn straw into gold, at least not when it comes to creating a rich organic soil for planting. Straw bales provide the ideal growing environment for tomatoes and other vegetables when they have been properly prepared. These instant raised beds hold plants above the ground, making picking and harvesting tomatoes convenient for those with limited mobility. Preparing the bale with water and fertilizer speeds the decomposition process and the center of the bale becomes rich compost, often referred to as gardener’s gold. Place the straw bales in a location that receives at least six to eight hours of direct sunlight. Choose a well-drained area, as water drains through the bales and into the existing soil. Lay the bale down on the soil so the rope that holds the bale together is on the outside with an open end facing upward. Position the bale so the top is level. Adjust by leveling the soil beneath the bale, if necessary. Apply water to the bale until it runs free from the bottom. Repeat the procedure daily for three days. Sprinkle 1/2 cup of ammonium nitrate or bone meal over the top of the bale and apply two to three gallons of water to initiate the decomposition process, turning the inside of the bale to compost. Repeat daily for three days. Reduce the amount of ammonium nitrate or bone meal to 1/4 cup. Sprinkle over the top of the bale and water as on previous days. Repeat once a day for the next three days. Sprinkle 1 cup of 5-10-10 fertilizer over the bale and water thoroughly on the 10th day. Test the temperature inside of the bale by inserting a hand into the bale, checking to see if the center of the bale is warm to the touch. Allow the bale to sit for an additional day or two until it cools down if it is uncomfortable to the touch. Make a hole large enough to insert the tomato's rootball into the top of the bale, pulling back the straw by hand. Add 1 or 2 qts. of well-rotted compost to the hole. Plant tomato seedlings in the compost. Insert the seedling up to the first set of leaves and firm the compost around the roots. Close the opening in the straw by hand. Water the bale deeply once or twice a week, depending on the weather and rainfall, to keep the inside of the bale moist. 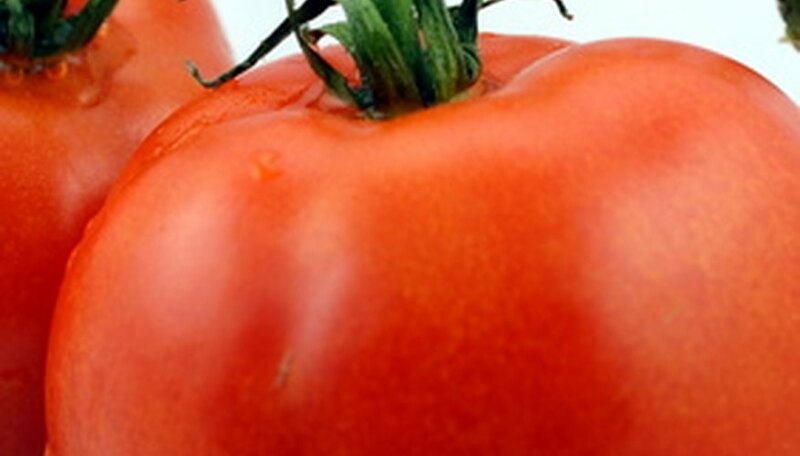 Fertilize with water-soluble fertilizer designed for tomatoes every 10 to 14 days. Follow the label instructions for application amounts. Hay bales may be used in place of straw bales, but they produce more weeds. One bale holds two tomato plants. Bales placed on paved driveways or cement leaves puddles around the bale. Ammonium nitrate is explosive. Follow manufacturer's instructions for handling and storage. You may be required to sign or register the purchase of ammonium nitrate and state its intended use.